We all love new subscribers to our email list. 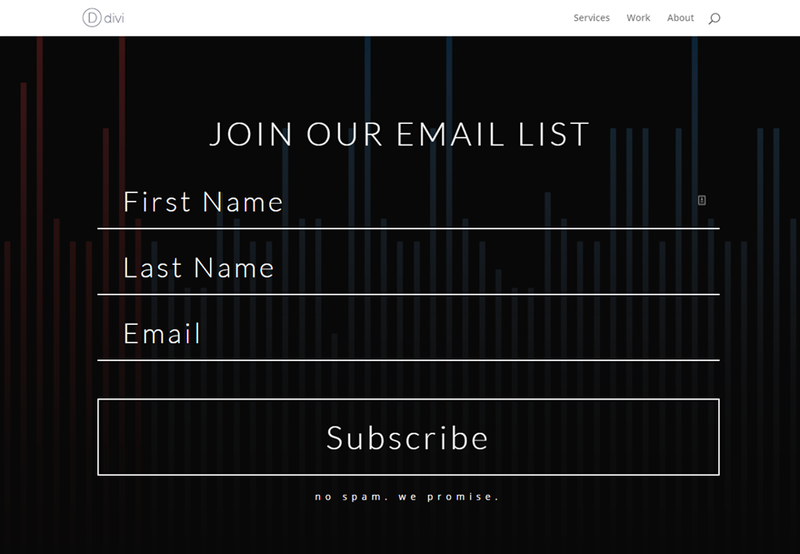 And one of the primary ways to get new subscribers is to provide your visitors with a well designed email opt-in form. 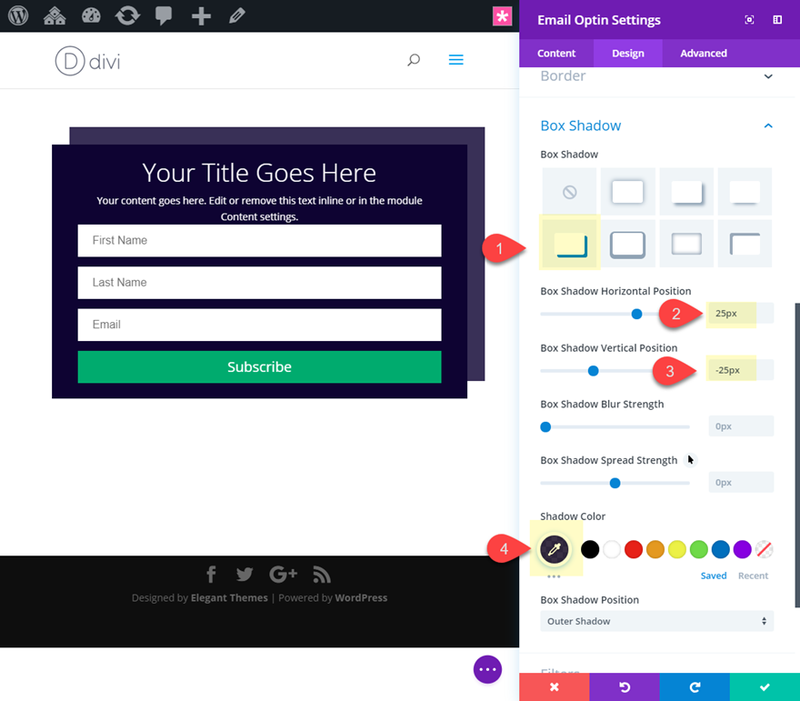 That’s why in this tutorial, I’m going to show you how to achieve five different designs with the Divi email opt-in module to help spark your imagination as to what is possible with this powerful and flexible module. 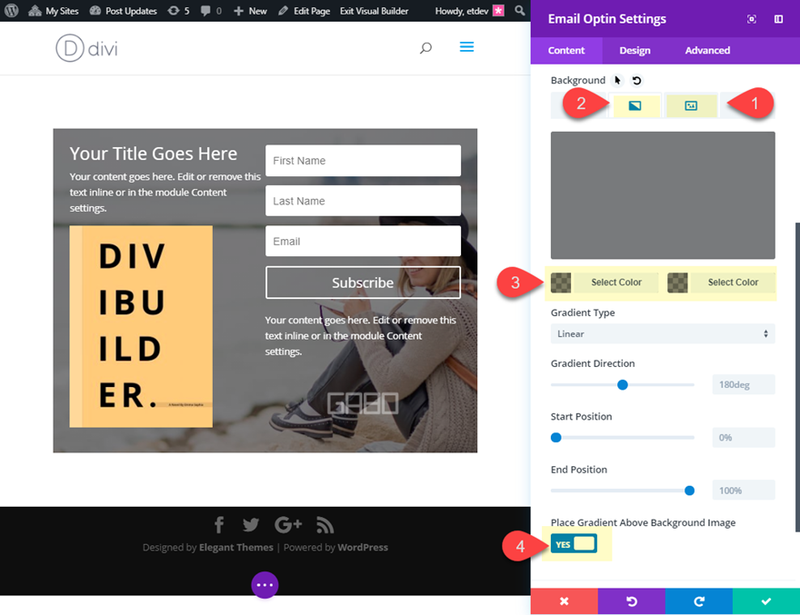 Here is a preview of the five Divi Email Opt-in Module designs we will be tackling today. 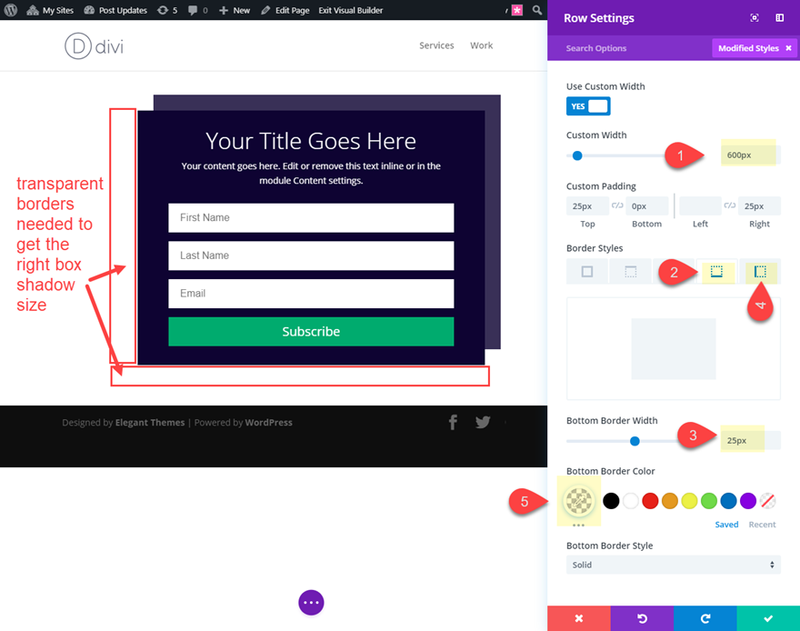 For this tutorial, all you will need is Divi. We will be building each one from scratch so no need for a premade layout. However, I will be using a few images from some of our layout packs but you can use your own if you want. 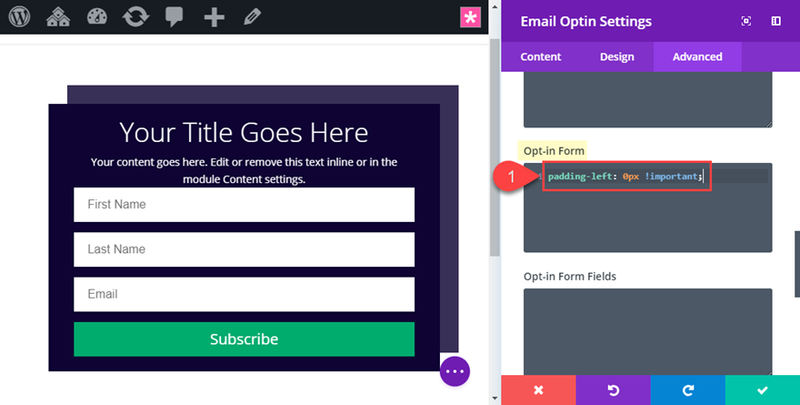 Also, it is important to know that you will not be able to see the optin form fields on the live site until you assign an email provider/list to your email opt-in module. You can do this in your email optin settings under Email Account. Now let’s get to those designs! 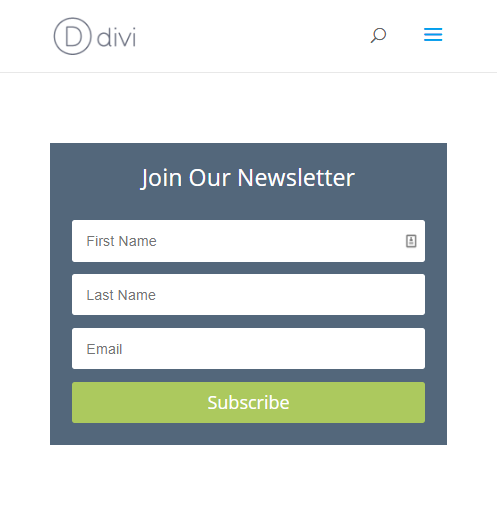 This design adds two box shadows to the Divi email opt-in module for a unique stacking effect that makes the form pop. 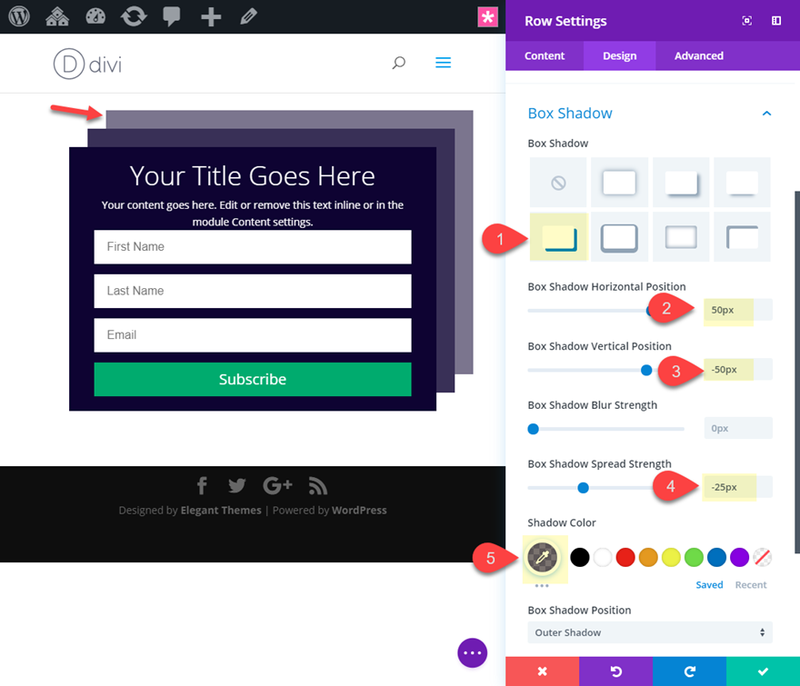 The first box shadow is added to the email opt-in module and the second box shadow is added to the row which has a custom size and border to make it work. Here is how it’s done. 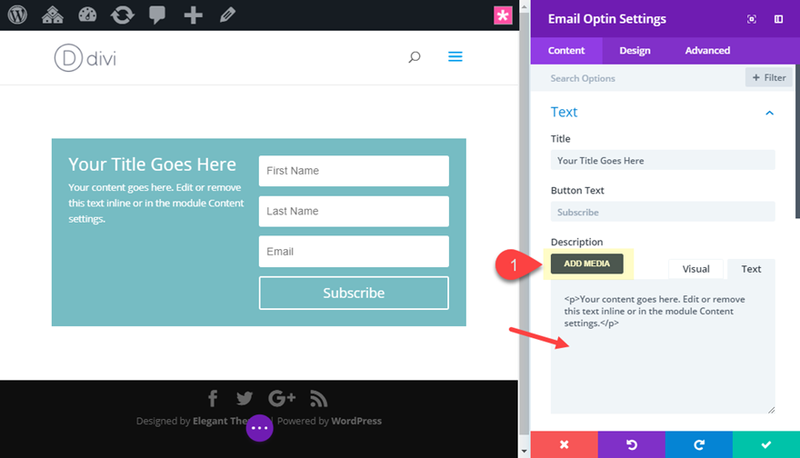 First create a new section with a one-column row and add the email opt-in module to the row. Now let’s add our first box shadow layer behind our email opt-in module. Now let’s add a small snippet of custom CSS in order to take out the left padding that is added to the form by default. Go to the advanced tab and add the following CSS under Opt-in Form. Now we can add the box shadow to the row. Now let’s check out the final design. This email opt-in design is minimal, clean, and big. 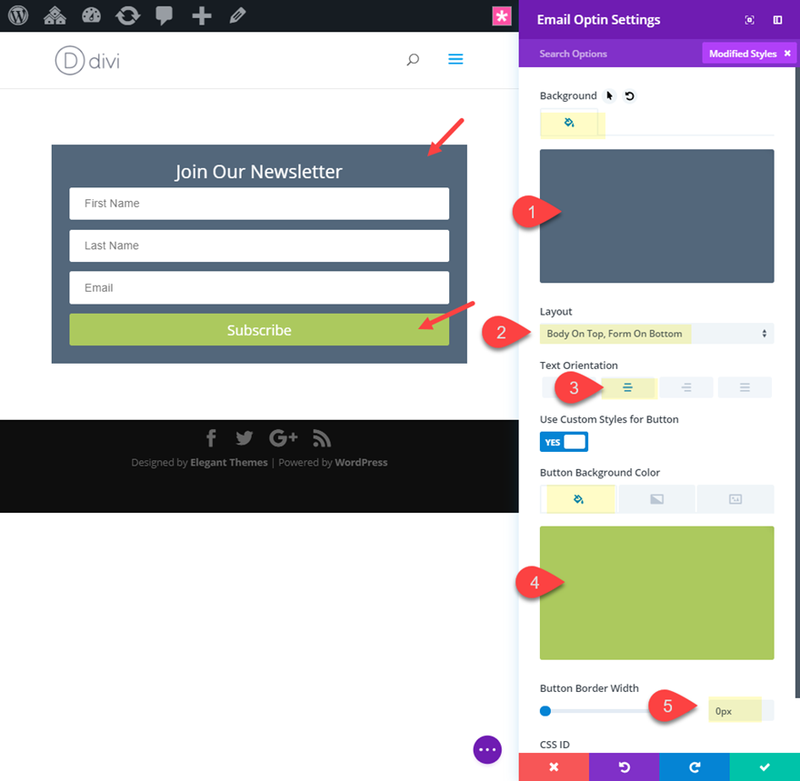 The form fields scale with the size of the browser so that it looks great on all devices. And it’s not too big that it forces the user to scroll. 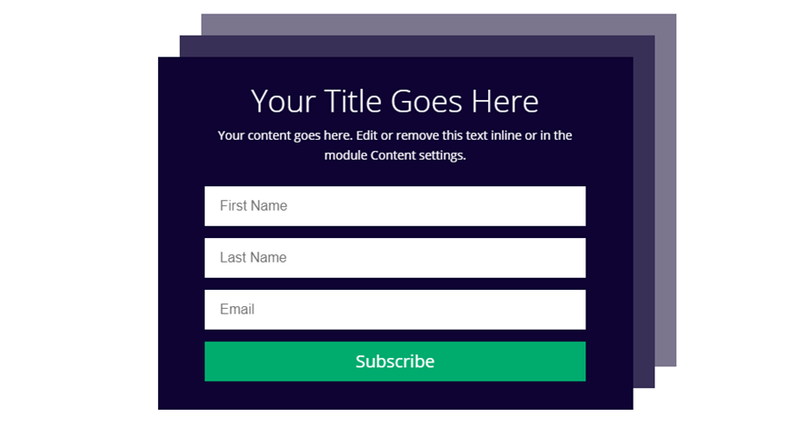 Open the email opt-in settings and update the content to include your Title and Footer text. Tip: Using a 100% custom width is a great way to make sure your design doesn’t get any right or left margin on mobile. If you use the “Make Fullwidth” option, your max width will be 89% so you will still have margins on mobile. Notice the use of the vw length unit for font size combined with the em length unit for line height and letter spacing. This allows the text and design to scale seamlessly when adjusting your browser. This will allow the size of the text when typing to match the placeholder text in your form fields. This next design is sure to be a popular solution for companies and blogs looking to save some vertical space on their posts or landing pages. 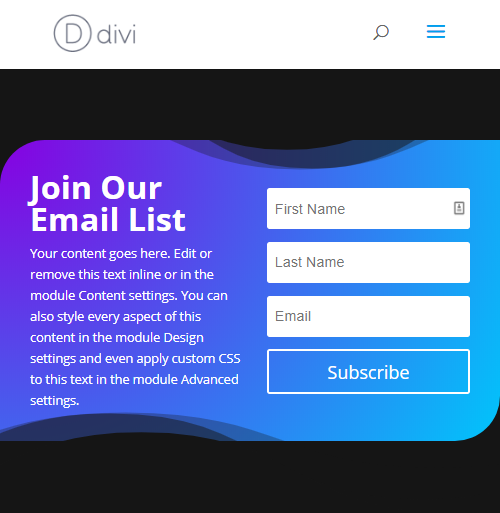 Even though Divi’s Email Opt-in module is best for more traditional vertical forms, you can actually convert the form to a skinny horizontal form with just a small snippet of CSS. 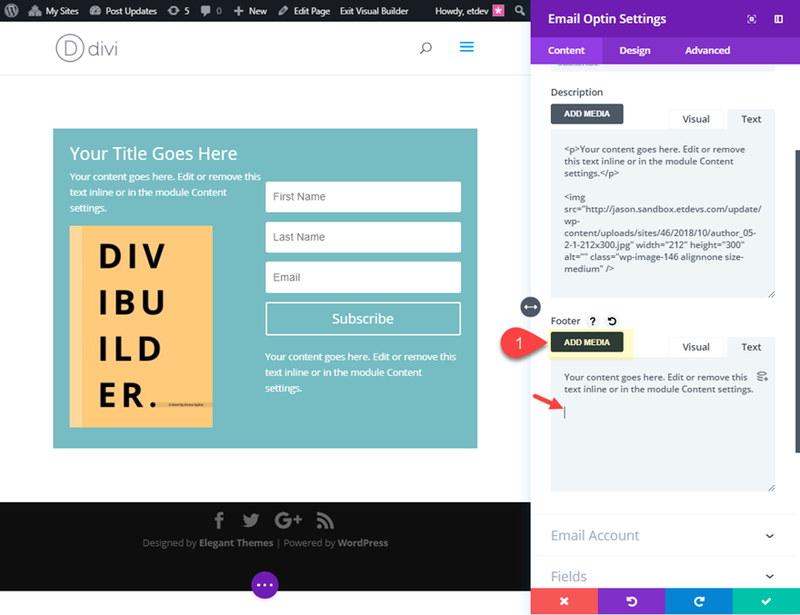 Create a new section with a one-column row and add the email opt-in module to the row. Open the email opt-in settings and update the content to include a Title but nothing else. Now it’s time for the custom CSS. 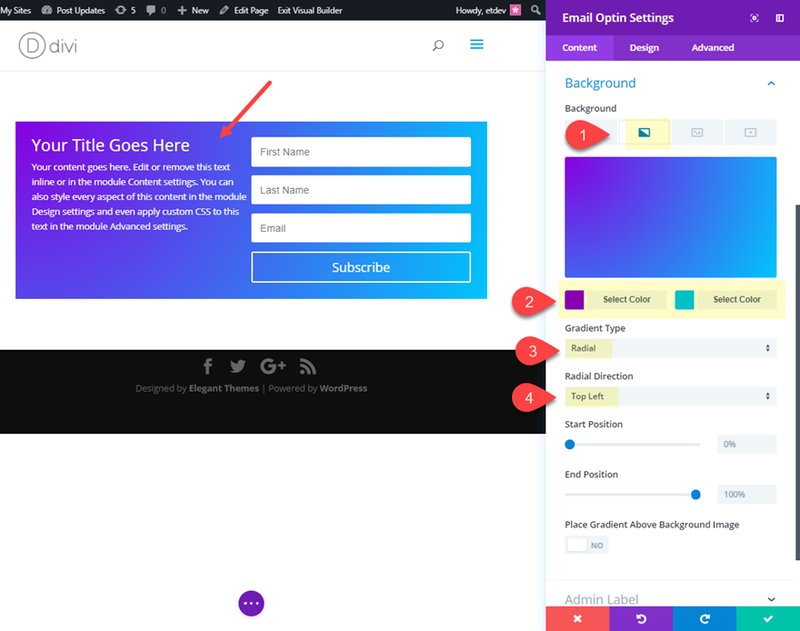 Since we want the skinny form design only on desktop (and not on mobile), we will be adding the CSS to the page (under page settings) using a Custom CSS ID to target the form style. To do this, go to the advanced tab and give the opt-in module a custom CSS ID. This will be used to target this form with the external CSS we will add to the page. Now open the Divi Builder page settings and add the following CSS under the Advanced tab. Since Divi already uses flex to style the form on the backend, this CSS takes out the flex-wrap property that causes the form fields to align vertically. 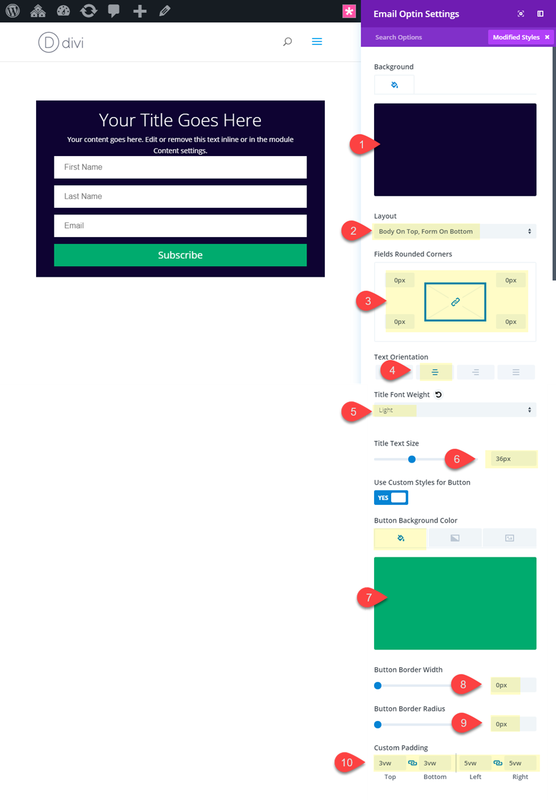 The result is a horizontal layout of the form fields. Adjusting the flex-basis property to 23% basically sets the width of each of the form fields. 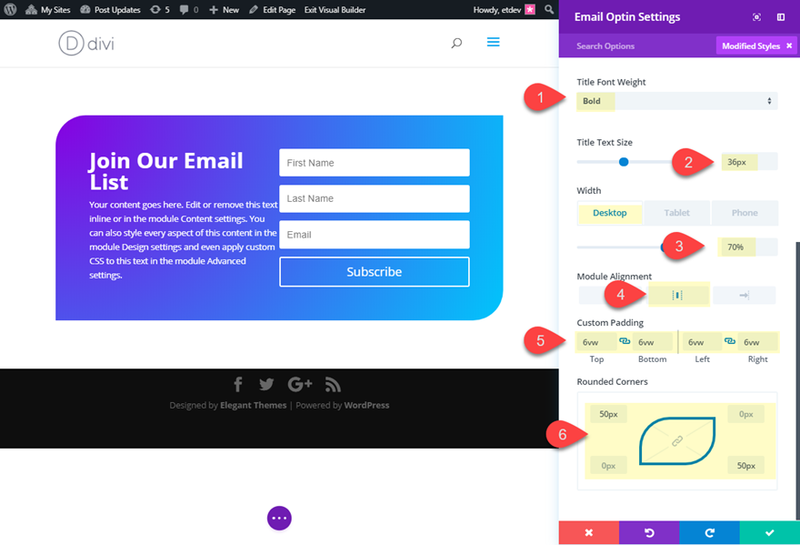 And because we added the CSS inside a media query, the design will only happen on desktop with the default layout of the form displaying on mobile. 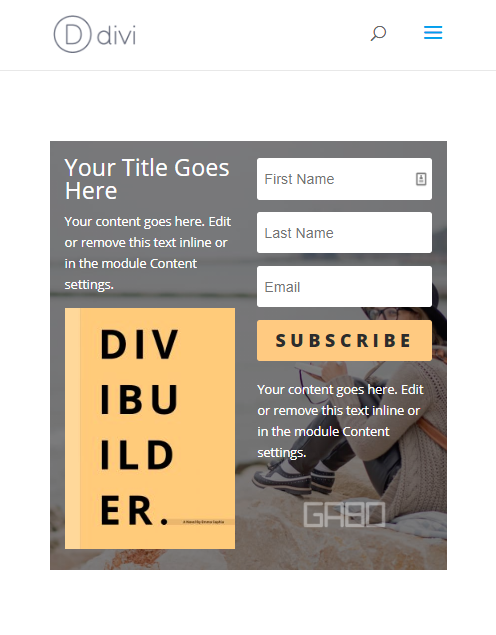 This design incorporates a few images within the email opt-in module for the purposes of promoting a free book offer for signing up. 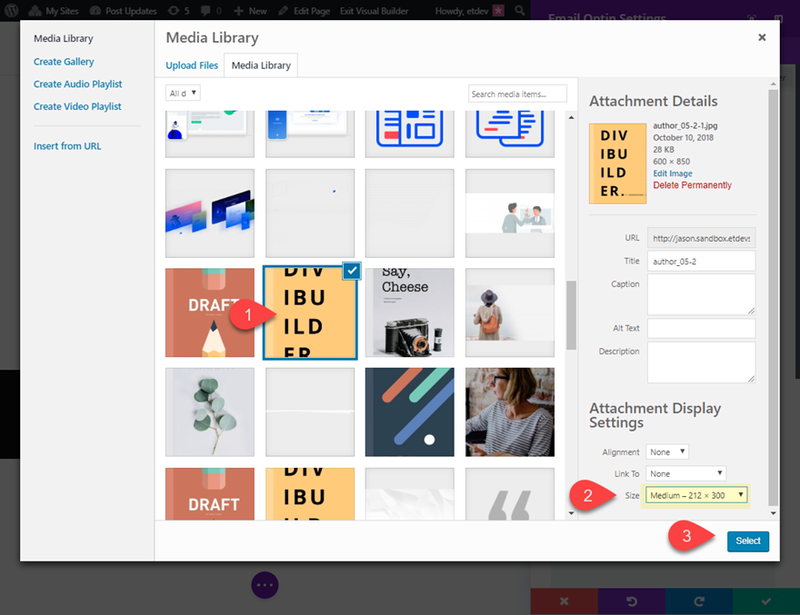 To do this, all you need to do is add an image using the built-in wysiwyg editor for adding description and footer content. 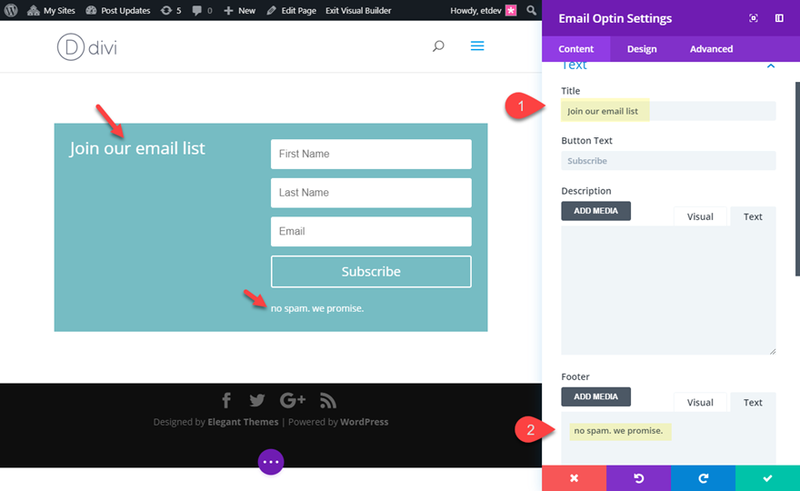 It is true that you can accomplish this same design by combining the email opt-in module with other modules in a two column row, but I thought it would be helpful to show how to do it all in the same module. Open the email opt-in settings and stay in the content tab. Under description, shorten the default text to only a couple of sentences. 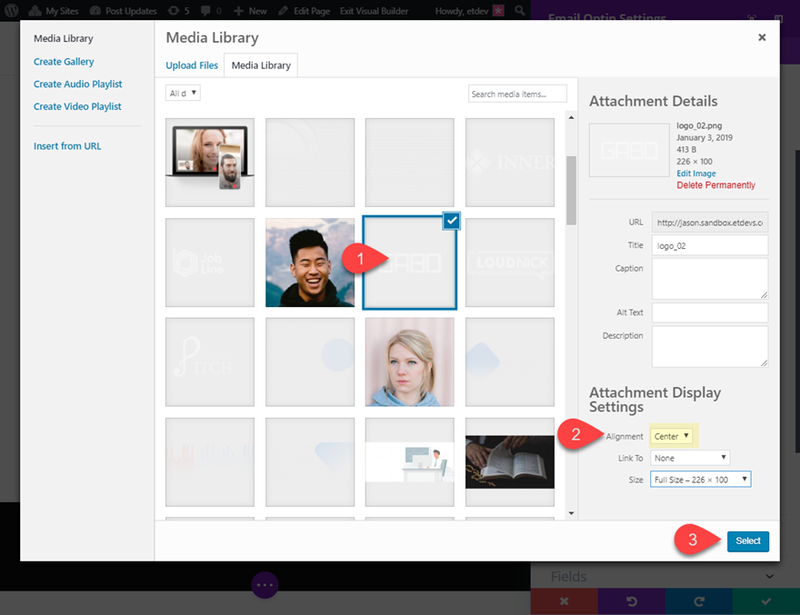 Then add an image from your media library by clicking the Add Media button. You want to make sure the image is no more than about 200px wide. For this example, I’m using the medium size of the image. 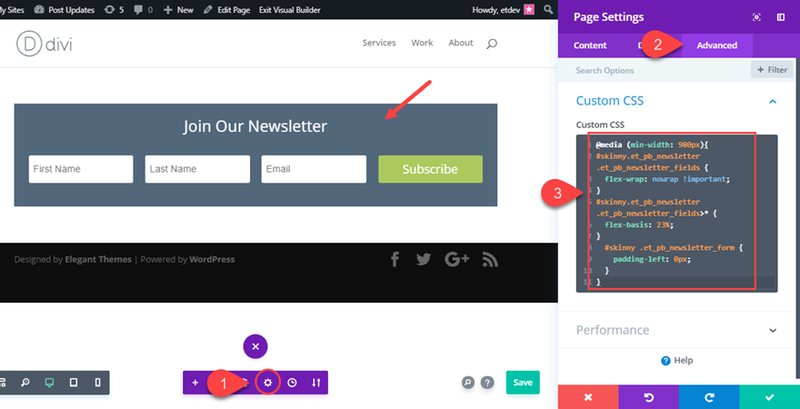 Under Footer, add a few sentences for the footer text content and then click the Add Media button to add a logo image under the text (this is optional of course). To make sure the image is centered, set the alignment option to center when adding the image from the media library. Now you are ready to update the rest of the design. Start by giving the module a background image and a background gradient above the image to make the text more readable. 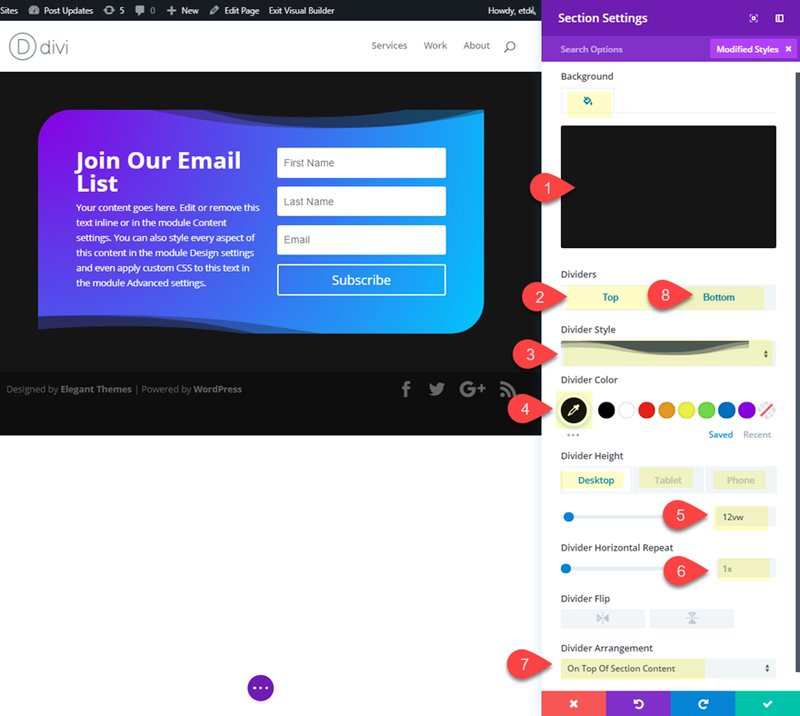 This simple design technique is a great way to give your email opt-in a unique look. The trick is to use section dividers that have the same color as the section background. 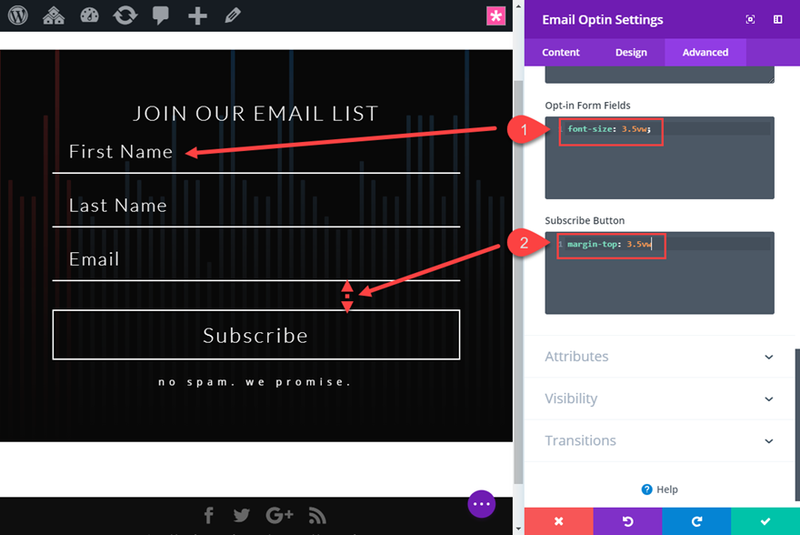 Then by adjust the height of the dividers, you can overlap the email opt-in form in order to cut out the edges in a unique way for nice framing effect. 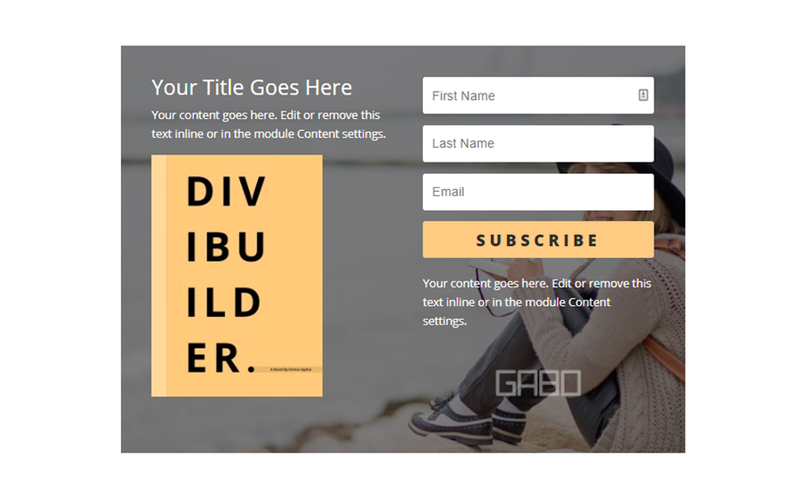 Open the email opt-in settings and give your module a background gradient. 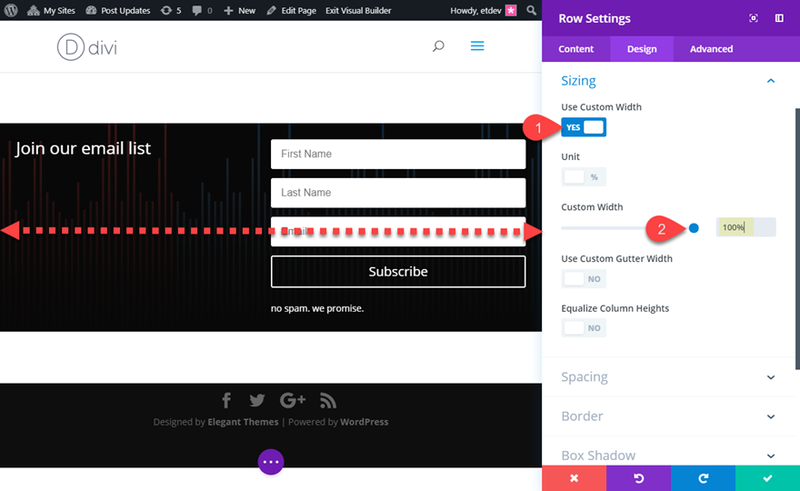 Then update your row settings with a custom width. Now we are ready to customize the section setting to add our cut-out frame effect with those section dividers. Check out post on creating unique frame designs for more on this design technique. These email opt-in designs are really just the tip of the iceberg when you think about all the style options available within Divi. I purposefully kept the designs simple enough to give you the broad strokes of what you can do. Feel free to explore more polished designs on your own by adding new fonts, colors, and hover effects. And don’t forget to have some fun in the process. 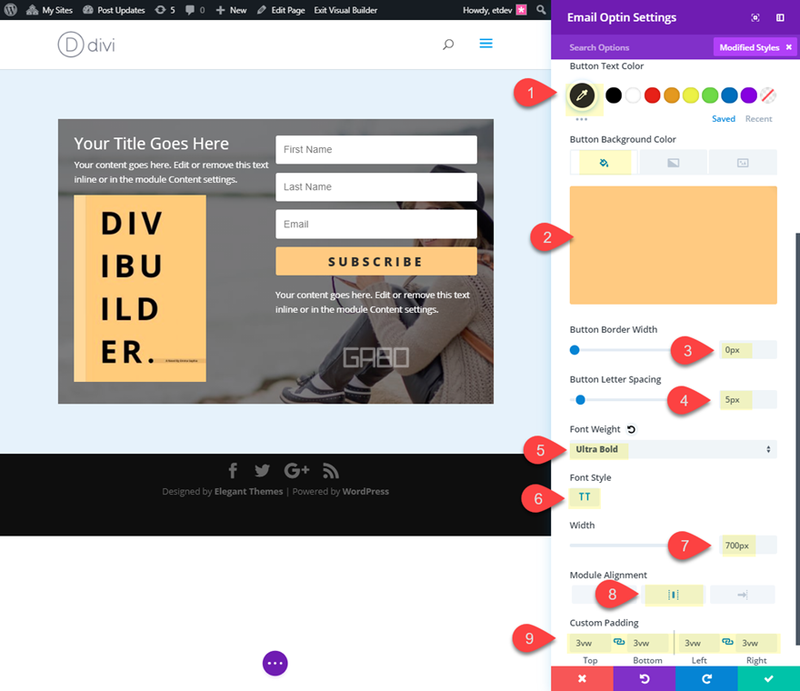 The post 5 Email Opt-in Designs You Can Create with Divi’s Email Opt-in Module appeared first on Elegant Themes Blog.